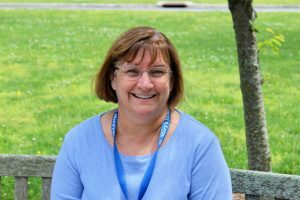 Vicki Dixon has worked at St. Mary’s as our speech language pathologist since August 2016. Her job involves providing communication evaluations and therapeutic sessions for the children and young adults who are exhibiting speech and language deficits. Vicki works primarily with the children in Neighborhood 2 and with the adults in The Albero House, but she also has worked with some of the children in other neighborhoods at St. Mary’s. Vicki has worked with people with intellectual disabilities for almost 25 years. She had the opportunity to work as a volunteer with people with communication needs throughout her teen and college years, working in an adult day program, working at a residential facility with persons with intellectual disabilities, and with children with language deficits. “Once I started spending time with these amazing individuals, I was hooked and could not imagine doing anything else,” she says. Happy Better Hearing & Speech Month, Vicki! Thank you for providing life-altering treatment that means communication for all!